The Milanese driving for team Ghinzani got the third win of the season after the double victory scored in Imola. 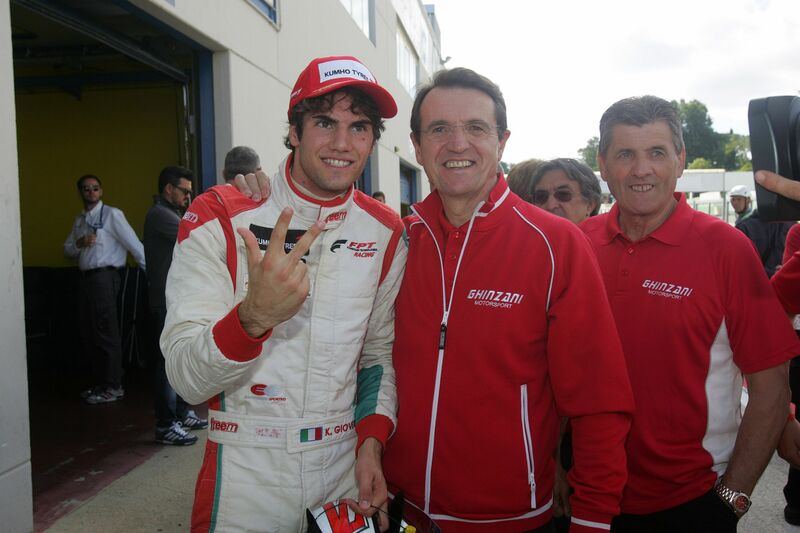 Behind him, Brandon Maisano (Prema) and Riccardo Agostini (JD Motorsport). Cheever made a mistake and wasted the second position. 16/09/2012 - The Milanese of team Ghinzani obtained the third win after the two scored in Imola. Giovesi, started in second, took Agostini at the start after a move to the limit that forced the driver from Padova to put two wheels on the grass. Agostini, on the Mygale of JD Motorsport, lost two more positions to his closest rivals in the championship: Brandon Maisano and Eddie Cheever, both on the Dallara F308 belonging to Prema Powerteam. Cheever wasted his race at lap thirteen when he braked on the grass spinning at the hairpin. At the flag, Giovesi obtained the win ahead of the French of Prema Powerteam, supported by Ferrari Driver Academy, Brandon Maisano and Riccardo Agostini. The fourth position at the finish line went to Henrique Martins (Prema Powerteam) who proceeded his team mate Eddie Cheever. Sixth place for Mario Marasca (BVM) who produced a good race ahead of Sergey Sirotkin. Euronova’s driver from Moscow was forced to start from the pits due to some engine problems before the start. Fixed the problems, Sirotkin, started from the back of the group and managed to proceed at the flag the Romanian of Ghinzani, Ghinzani Robert Visoiu and his team mate at Euronova, Yoshitaka Kuroda. A contact put out of the games Nicholas Latifi and Michael Heche. The Swiss driving for BVM attempted a move to the Canadian of JD Motorsport at the semaphore corner, but there was not enough room and the contact was unavoidable. The sprint race will start at 16.00 (GMT+2). It will be broadcast recorded on Rai Sport 2 at 17.20, while it will be live on web streaming at www.acisportitalia.it/F3. Nicholas Latifi will start from the pole position with Henrique Martins at his side. Giovesi and Cheever will be starting from the second row, while Maisano and Agostini will follow them in third.